In this third edition, each step, including the definitions of the various roles to be evaluated, has been expanded and enhanced based on the experiences of many institutions that have followed the procedure outlined in the book. The third edition also features a new introduction; fresh research in the field; updated forms and procedures; a new, detailed case study of an institution that developed a Web-enabled, computer-supported system based on the eight-step process; and a new body of work that defines the professoriate as a meta-profession with a rubric for defining more than twenty faculty skill sets. Readers will learn how to generate and use an overall composite rating in promotion, tenure, merit pay, and post-tenure review decisions; they will also discover the issues in designing or finding, using and cataloging student rating forms. Sample forms, worksheets, models, and sample faculty evaluation manuals round out this practical, user-friendly handbook for anyone developing a faculty evaluation system. Raoul A. Arreola received his Ph.D. in educational psychology from Arizona State University in 1969, specializing in educational research and measurement. He has taught in the areas of statistics, educational psychology, personnel educational, and educational leadership, and has held a number of faculty and administrative positions involving assessment, strategic planning, faculty evaluation , and faculty development. These positions include director of the Office of Evaluation Services, associate director of the Learning Systems Institute, and associate professor of educational research and measurement at Florida State University, director of the Center for Instructional Services and research and professor of educational psychology at the University of Memphis; and professor and chair of the Department of Education, assistant dean for assessment and planning, director of educational technology, and director of institutional research, assessment, and planning at the University of Tennessee Health Service Center. Dr. Arreola currently serves as director of assessment and professor of pharmaceutical sciences in the College of Pharmacy at the University of Tennessee Health Science Center. Dr. Arreola has worked and published in the field of faculty evaluation and development for 36 years and has served as a consultant nationally and internationally to more than 250 colleges and universities in designing and operating faculty evaluation and development programs. He has also served as a consultant to the U.S. Department of labor and the Florida House of Representatives on designing and evaluating professional and occupational licensing examination procedures. He is president of his own consulting firm, the Center for Educational Development and Evaluation (CEDA), which offers consulting and national workshops on developing and assessing faculty performance. These workshops have been attended by thousands of faculty and administrators from more than 500 college and universities. In 2004 Dr. Arreola was presented with the McKeachie Career Achievement Award by the Special Interest group of faculty teaching Evaluation, and Development of the American Educational Research Association for his contributions to the field of assessing and developing faculty performance. In 2005 the American Educational Research Association presented him with the prestigious Interpretive Scholarship Award in recognition for his work in developing the meta-profession model of the professoriate, which underpins the processes described in this volume. Raoul Arreola is married to Dr. Mona J. Arreola, associate director of the cancer center of St. Jude Children’s Research hospital. They have four grown children and nine grandchildren (so far). 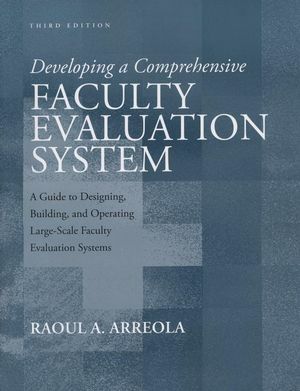 Introduction: Preliminary Issues in Planning of the Development of a Comprehensive Faculty Evaluation System. 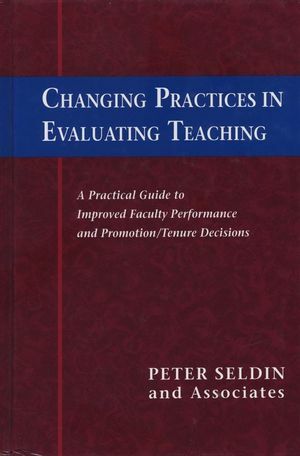 Faculty Evaluation: Fast, Fair, Cheap (Pick Any Two). The Trap of Best Practices. Linking Faculty Evaluation and Faculty Development. Obstacles to Establishing Successful Programs. Guidelines for Overcoming Obstacles and Avoiding Errors. Practical Considerations in Planning the Development of Your Faculty Evaluation System. 1. Step 1: Determining the Faculty Role Model. 2. Step 2: Determining Faculty Role Model Parameter Values. Determining College or Institutional Parameter Values. 3. Step 3: Defining Roles in the Faculty Role Model. Defining the Teaching Role: Perspectives on the Definition of Teaching. Defining Teaching for Faculty Evaluation and Development Systems. Completing Step 3: Determining Role Definitions for Your Faculty Role Model. 4. Step 4: Determining Role Component Weights. Case 1: Component Weights Fixed. Case 2: Required and Optional Components With Fixed or Variable Weights. Case 3: Mix of Required an Optional Components With Fixed or Variable Weights Gathering the Role Component Weight Information. 5. Step 5: Determining Appropriate Sources of Information. 6. Step 6: Determining the Source Impact Weights. Determining the Source Weights .Determining the Source Impact. 7. Step 7: Determining How Information Should Be Gathered. 8. Step 8: Completing the System: Selecting or Designing Forms, Protocols, and Rating Scale. Faculty Evaluation Tools and Procedures. Timetable for Developing a Comprehensive Faculty Evaluation System. 9. Generating an Overall Composite Rating. Computing the Composite Role Rating. Individualizing the Evaluations: the Overall Composite Ratings (OCR). Responding to Concerns in Using a Single Numerical Index (OCR). 10. Using the OCR in Promotion, Tenure, Merit Pay, and Post-Tenure Review Decisions. Using the OCR in Merit Pay Decisions. 11. Operating the Faculty Evaluation System: Peer Input and Review Issues. What Information Can Peers Provide? Adapting Traditional Peer Review and Evaluation Systems. Peer Observation of Classroom Performance. 12. Student Ratings: What More Than 80 Years of Research Tell Us. 13. Operating the Faculty Evaluation System: Issues in Designing and Using Student rating Forms. Designing a Valid and Reliable Student Rating Form. Options for Administering Ratings Forms in Class. Format of the Student Rating Form Computerized Analysis Output. Interpreting and Using Student Rating Results. Faculty Evaluation and Professional Enrichment. 14. Catalog of Student Rating Items. Self-Reported Course Impact on the Student. Alternate and Supplementary Teaching/Learning Environments. 15. Commercially Available Student Rating Forms. Checklist for Identifying and Selecting Published Forms. Review of Selected Published or Commercially Available Student Rating Forms. Aleamoni Course/Instructor Evaluation Questionnaire (CIEQ). IDEA Student Ratings of Instruction. Student Instructional Report II (SIR II). 16. Case Studies and Sample Faculty Evaluation Manuals. Frostburg State University Case Study. Frostburg State University Faculty Evaluation System. Georgia Perimeter College Faculty Evaluation System. Fairmont State University Case Study.